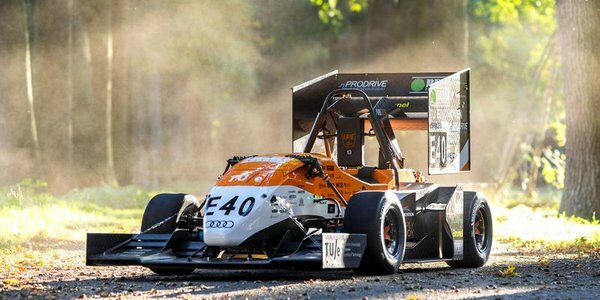 Having again achieved laudable results this summer with its electric racing car, University Racing Eindhoven (URE) will be going all out this coming year to build the driverless racer it announced earlier. With the URE14, the student team is setting its sights clearly on participating in the Formula Student Driverless. Last Tuesday URE won the KIVI Best Student Team Award. All the effort invested during this year nonetheless drew a result last Tuesday when URE won the KIVI Best Student Team Award 2018 and the purse of three thousand euros that comes with it. In seizing victory, URE outdid two other TU/e teams, InMotion and Solar Team Eindhoven. According to Engels, work has now been resumed on the project stopped in May, and the URE11 (which was driven in 2016) is serving as a test platform, “but we aren't planning a big reveal. Later we'll convert the URE14, but of course we don't have that yet.” The URE11 incidentally has not yet driven a single meter driverless, but you can be sure that will happen in “the coming weeks”, the team manager guarantees. The scenario the team faced last season - simultaneously building two cars - is something URE is now keen to avoid. Accordingly, the whole team is now working towards a single goal: building a racing car that can be converted into an driverless racer in under three hours. The main aim is to build a suitable car for taking part in Formula Student Driverless. Whereas last year URE was streets ahead of the competition in the battle for the honorary title of ‘first driverless racing car in the Benelux’, this year the team must take serious account of competition from Delft. The Delft team likewise wants to have a driverless racing car on the track in the summer of 2019.